I’ve always been a Filofax girl, so when I first came across the concept of “bullet journaling”, I was sceptical. The whole thing just seemed a bit too gimmicky. More with less. Okay. You’re talking my language. Go on . . . So basically, I just keep my calendar, musings, meal plan, to do list, dreams, goals, aspirations, and doodles all in one notebook. What’s so groundbreaking about that? It wasn’t until I began experimenting with my own bullet journal that I started to get what all of the fuss was about. Although the original bullet journal is a special edition leuchtturm1917, you can really use any notebook you like. Just consider how you’ll be using it beforehand. I chose a to use a large, soft cover Moleskine notebook with dots. The “large” size isn’t really that large – it’s the perfect size for writing and is small enough to keep in my bag all day long. I always prefer soft cover because I like to completely fold over the front cover. I opted for dots because I could use them to create my own sections, lines, diagrams, etc. Trust me, you’ll spend a lot of time writing once you get stared, so pick a pen you love. I’m a huge fan of Pilot Frixion medium tip erasable pens (I use black, but they come in lots of colours) because I’m slightly OCD and like to correct my mistakes. They also make highlighters and markers which I use for drawing lines and marking off sections. I tried out lots of erasables, and these are definitely the best. They leave no marks or scuffs, and you can erase again and again. They also write very smoothly. 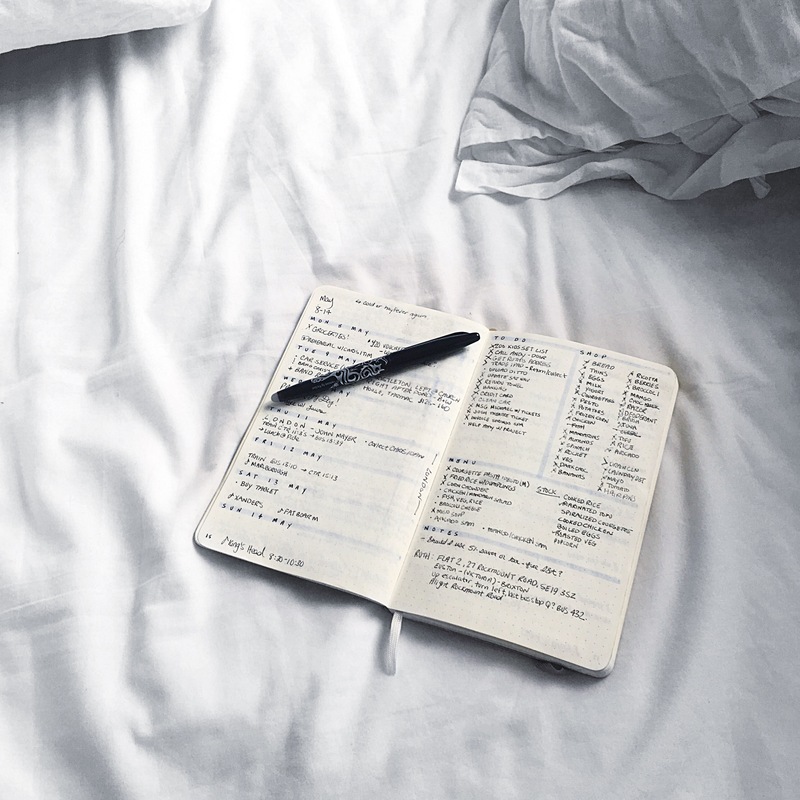 daily log – your day: appointments, tasks, to-dos, reviews, thoughts. You can stick with the original format, or come up with your own like I did! Weekly spread (before): daily diary on the left, and to-dos, shopping list, menu, and notes on the right. Future log: Year on one page. Monthly log, 4 months to a spread. I write all upcoming events, shows, birthday, etc here so I can see them at a glance. 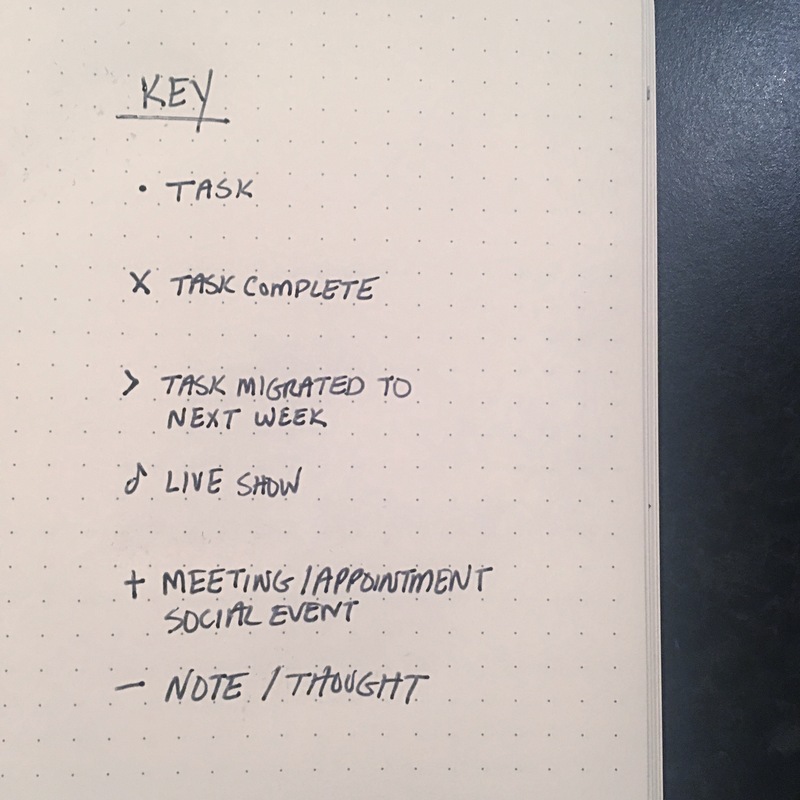 Weekly spread (after): includes tasks, notes, completed tasks, migrated tasks, and lots of other stuff. Lots of people employ complex (and often beautiful) keys/symbols in order to define categories or types of tasks. I decided to keep it simple. I did not colour code, but I did choose a very basic system for identifying and managing my notes. Here are a few “collections” or pages that I decided to include in my own journal. Health – prescriptions, allergies, doctor/dental/out of hours/emergency phone numbers, upcoming tests/appointments/results. Weight tracker. Security info and passwords – I don’t actually write out passwords or personal details. Instead I write clues to usernames and keys to jog my memory. Travel Scattegories – homemade game lists so I can play anywhere. I’ll never be bored on a train again! Yup. That all fits into one notebook. You can find lots of other ideas for collections from popular bullet journalists on Pinterest, or just use your imagination. I’ve been journaling for three months, and I love it. I’ve always kept a work diary/calendar, but this is different. 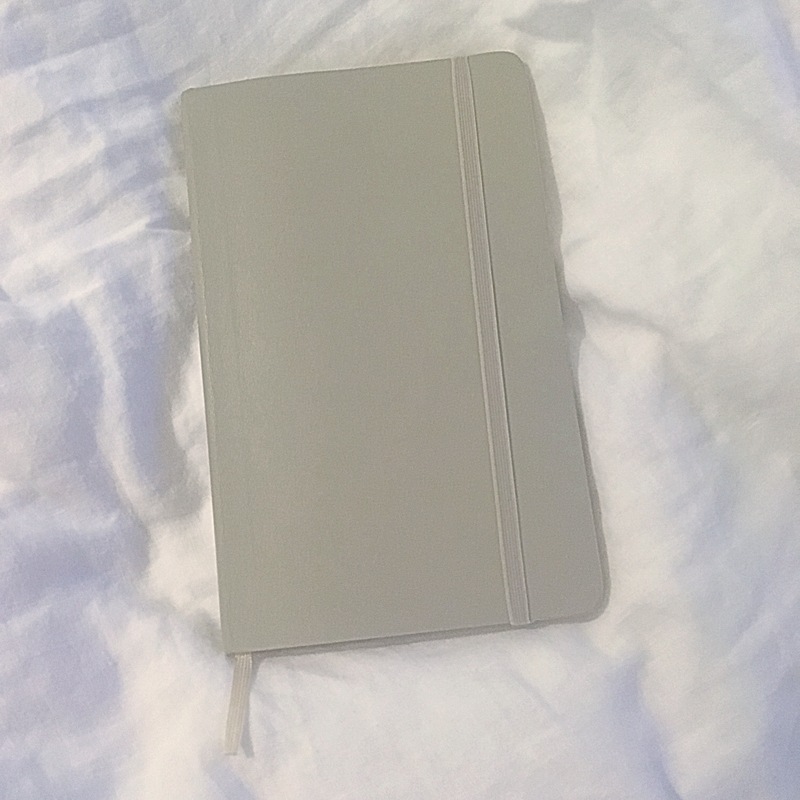 I have a place to log miscellaneaous things which, until now, I didn’t bother to express or record: reviews of campsites I might return to, restaurants to try, favourite quotes from books I’m reading, and general musings. I used to have a hundred apps for managing different lists and ideas – now everything is in one place and always on hand. The opportunity to scribble and doodle with pen and paper comes as welcome break from screens and keyboards. And while I’m not a hoarder of physical souvenirs, I like that I now have one tidy little book of my everyday adventures, thoughts, and feelings to look back on and reminisce. My bullet journal is simultaneously a practical tool and an emotional keepsake which has quickly become one of my most treasured possessions. How would you use a bullet journal? What collections would you include? Some really good ideas for putting in my bullet journal. I currently have too many blank pages!